During the dissertation research year of my graduate schooling, I spent several months living in the Alsatian town of Colmar. The archives where I worked were a perfectly lovely, if lonely place to do historical research, but only open three days a week. Which meant that I had lots of time to explore Colmar. Alas, I didn’t make as much of that opportunity as I might have because I kept going back to the city’s main art museum, the Unterlinden, located in a one-time Dominican convent dating back to the 13th century. While Colmar native Martin Schongauer is best represented in the collection, and Reformation era artists Albrecht Dürer, Hans Holbein, and Lucas Cranach (“the elder” for Holbein and Cranach) make appearances, the reason that I kept coming back is the massive, intricate Isenheim Altarpiece, finished in 1516 by Matthias Grünewald. That’s a shame — and yet completely unsurprising. Nothing could be further from the gentle, smiling Christ of American imagining than the contorted Savior, wracked by sheer agony, who hangs in the center of Grünewald’s “Crucifixion” panel. Even if, like me, you’d seen an image of this panel in an art history course, it’s impossible to prepare oneself for the experience of seeing the panel in person. In part because it’s larger than you’d expect; mostly because it’s among the most terrifying images ever imagined (let alone painted!). One visitor, the 19th century novelist J.K. Huysmans, thought it was “as if a typhoon of art had been let loose” in the painting, produced for a monastery that treated victims of the painful skin disease known then as St. Anthony’s Fire (ergotism). A kind of late medieval art therapy, the painting gave Jesus the same agonizing sores that patients experienced — not so subtly communicating that their Savior knew their pain, that God was truly with them. I think of sitting there in front of that panel, struck speechless no matter how many times I visited, at some point during every Good Friday service I’ve ever attended. At a time when churches are bending over backwards to make their worship inviting and accessible to any and all, Tenebrae (Latin: “darkness, shadows”) is about as off-putting as possible: no words of welcome; confession of sins with no assurance of forgiveness; no offering or announcements to let us know that the work of the church will continue; we are not sent, merely straggle out in total darkness, not saying a word to anyone. 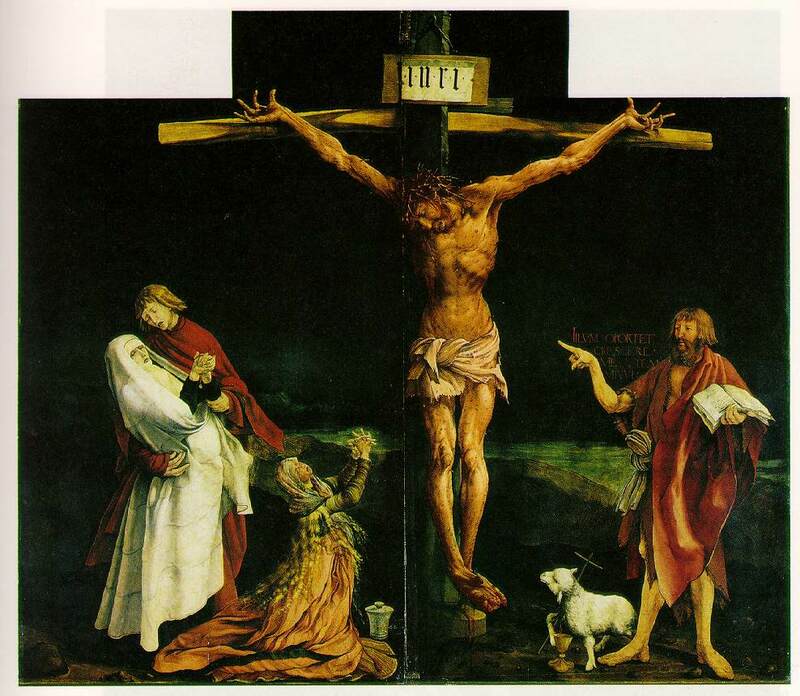 It’s the liturgical equivalent of Grünewald’s painting: merciless in its unpleasantness. And that’s how it ought to be: nothing can or should pretty up the Crucifixion, an event as brutal and appalling as it is truthful about the human condition in ways that modernity can barely begin to understand. 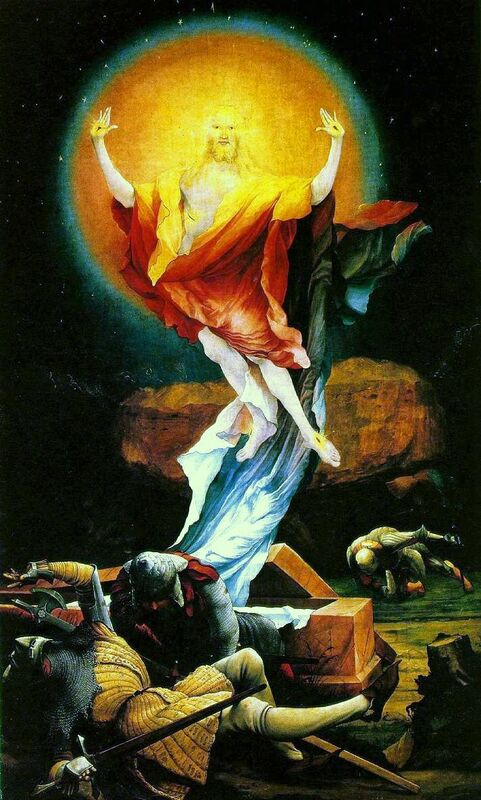 But by the same token, Easter worship should be all light and joy, suffused with the brilliance of the resurrection dawn. And that’s what’s actually most surprising about the Isenheim Altarpiece. Even if I didn’t really know how awful the Crucifixion scene would be in person, I at least knew to expect it. I had no idea, on the other hand, that the other side of the altarpiece featured an equally stunning depiction of the Resurrection. So where, O death, is your victory? Where is your sting? The one whose “appearance was so disfigured beyond that of any human being and his form marred beyond human likeness” (Isa 52:14) is risen. He is risen indeed!